I know he's not technically a "baby" anymore, but he's still MY baby -- and he'll tell you that. I wasn't that concerned when Jake coughed through the night Friday night, as he develops a cough every so often. But on Saturday morning he was running a fever of 101.8, so we gave him a good dose of Motrin and hoped for the best. Not normal. AB. NORMAL. 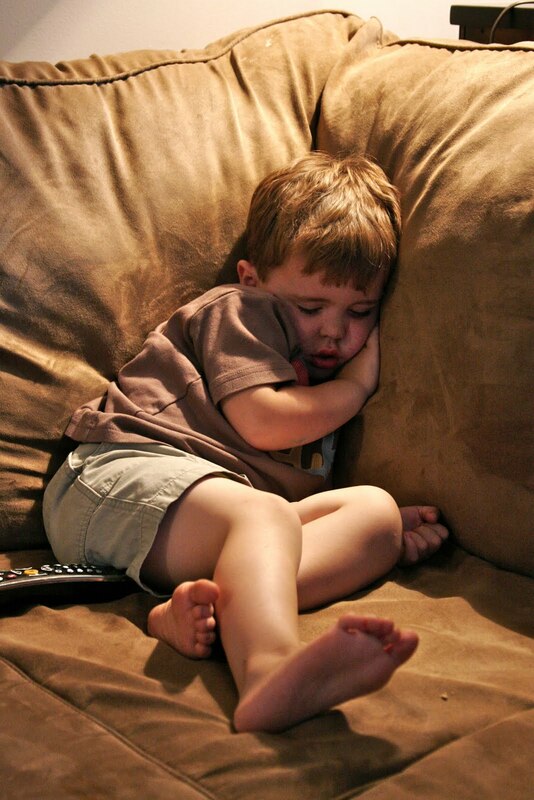 Poor thing was sacked out sitting up on the couch. When I scooped him up, he was so hot it felt like he was on fire. Worry set in at that point, and I took his temperature ... it was 104.1. His respiratory rate was also very high, about 80 breaths per minute, so I called the on-call nurse at our pediatrician's office. It sounded like we were headed back down the dreaded RSV path that we'd trod a few times before. I went ahead and gave him some Motrin to try to get his fever down while I spoke with the nurse. 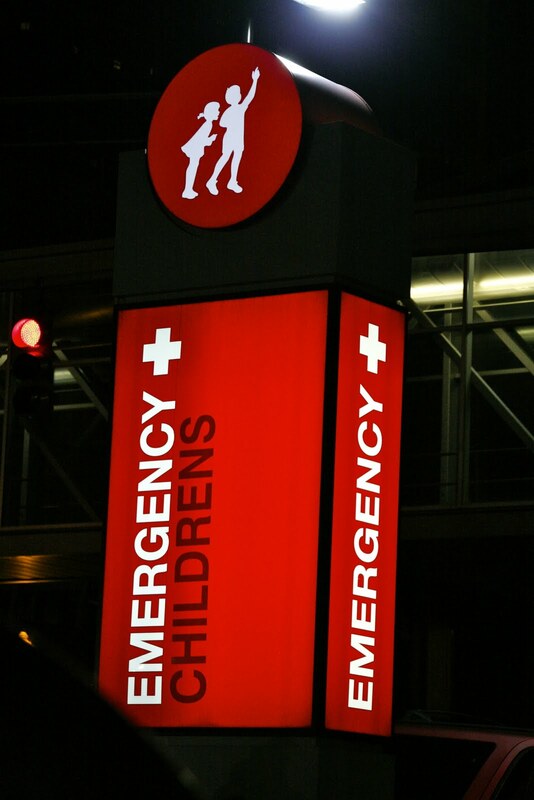 Sure enough, she sent us down to the ER at Children's Hospital, and I was relieved that although there were easily 40 people in the waiting room when we arrived, we were called back within about 15 minutes. His fever was back down to 101 when we were triaged, but his resp rate was still up around 50 to 55. The resident who was seeing us did a strep test, of which Jakey was NOT enamoured. The resident asked me to hold his head with one hand under his chin and the other behind his neck while she swabbed him, which was fine -- until he vomited down my arm. PLEASANT! The bulk of it hit my arm and his shorts, but I was nice to the Internet and only took a picture of his shirt. And by the way: you're missing out on the most interesting pictures (him in the ER waiting area, seeing the doctors, etc. ), because I wasn't willing to be the Crazy Lady taking pictures of her kid with her huge honking camera in the ER. Anyway, I had come prepared with a change of PJs for him, so I got him in those. Because his pulse-ox was hovering around 91 to 92%, the resident consulted with the attending, who ordered a chest x-ray. And if you've been checking in over the past few days, you know that the x-rays showed a little pneumonia in his left lung. Total bummer, but also totally treatable, and I was glad they caught it. 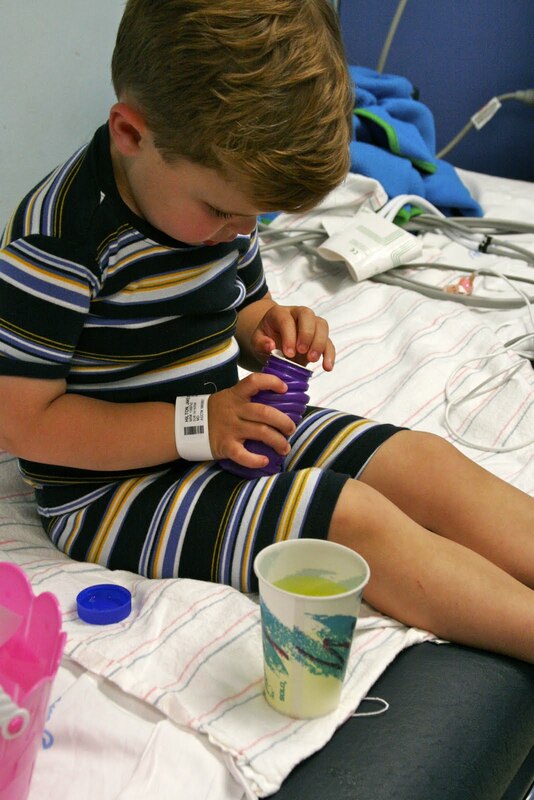 Since it was Easter Eve, they provided Jakey with a little Easter basket containing crayons, water colors and bubbles to entertain him while we waited on the various test results and for the other cogs in the hospital wheel to move. The main hold-up in our case was that Jake hadn't eaten in a couple of days but -- more seriously -- hadn't been drinking, either. 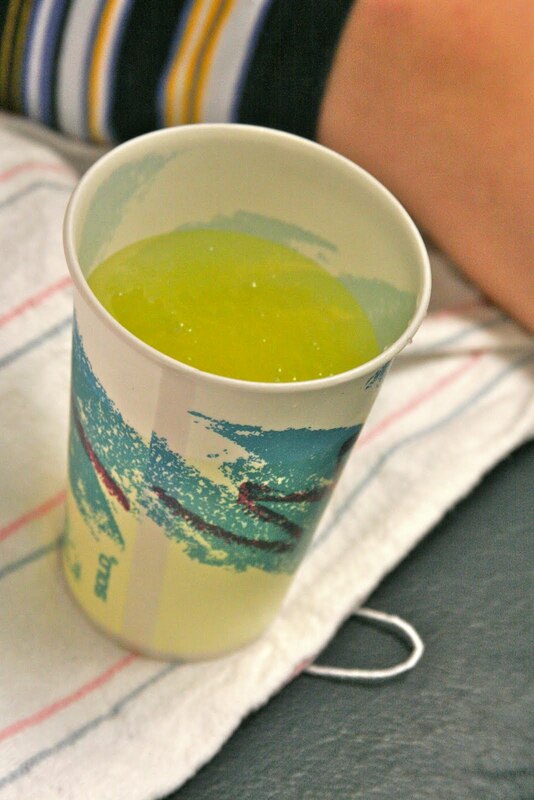 The attending explained to him that he couldn't leave the hospital until he drank this whole cup of Gatorade and had a wet diaper to show for it. Jake did NOT want to drink. We sat there for two hours, with the doctor poking her head in every so often to see how much he'd gotten down. Since he'd vomited recently, I wasn't too keen on forcing him to take it in as quickly as he possibly could, so we developed a system of Two Bubble Blows, One Sip of Gatorade. It was a very successful system. When the doctor came in for about the fifth time, she said (pretty patiently, I might add), "Jake. You do not get to leave this hospital until you drink that Gatorade. Drink." And my child who is apparently 3-going-on-13 heaved a gigantic sigh and said, "Ohhhh FINE." And then took one sip. I don't know what the exact Gatorade Consumption Time Elapsed was, but we left the hospital just before midnight and he was home in bed by 12:30. The Amoxicillin and Albuterol didn't seem to have much of an effect at all for the first couple of days, and when we went for our follow-up visit to our pediatrician on Monday afternoon, she said that it sounded like it had spread to his right lung. She kept him out of daycare through yesterday, but she didn't change his course of treatment. She felt confident that he would gradually improve, although it will probably take 10 to 14 days for him to get back to normal. Nonetheless, experiences like this remind me to be so thankful for modern medicine and the fact that we live in a city that boasts some of the most progressive, respected medical professionals in the country. Thank you all for your thoughts and prayers as we walk this road with sweet Jakey once again ... he is hanging in there and so are we! And later this week I'll try to catch you up on our multiple egg hunts and other fun things we've been doing in our "spare time." He could not be cuter.